We’re still hanging out in Many Glacier, and we thought that since we’re not going to be riding anywhere until Ted’s wheel shows up, it might be fun to write a few non-recap posts about our experiences and lessons learned so far on the trip. First up, a few pieces of gear that we are really happy we have with us! We were pretty careful about the gear we brought on this trip, and most of our things have some combination of durability, versatility, compactness, comfort, and low weight. When packing, we gleaned what we could from bike tour blogs and videos, and went rogue with some comfort-focused choices that would make (and have made) most bike tourists laugh. Here are some of our favorite things we brought, focusing on things we wouldn’t want to replace with a similar item of a different type. Coughlihan’s clothesline. When I bought this clothesline, Ted sighed and asked, “why wouldn’t we just use our bear bag rope to hang clothes?” Now it’s one of his favorite things. This clothesline has two strands of fabric-covered elastic that are twisted together such that you can hang your clothes by sticking pieces of cloth through the two lines. Clothes never fall off and you don’t need clothespins. Genius. 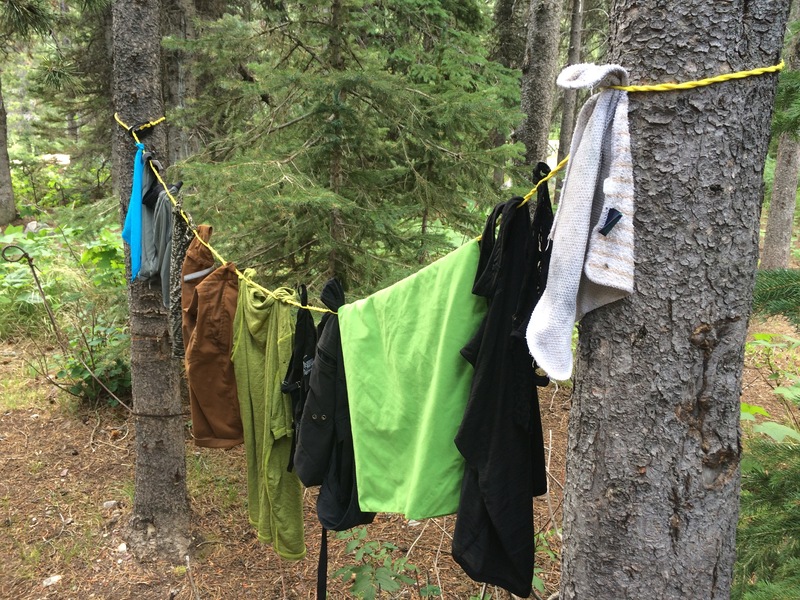 We wash a couple items of clothing every day, so this clothesline is in constant use. Fozzils Origami Bowls. 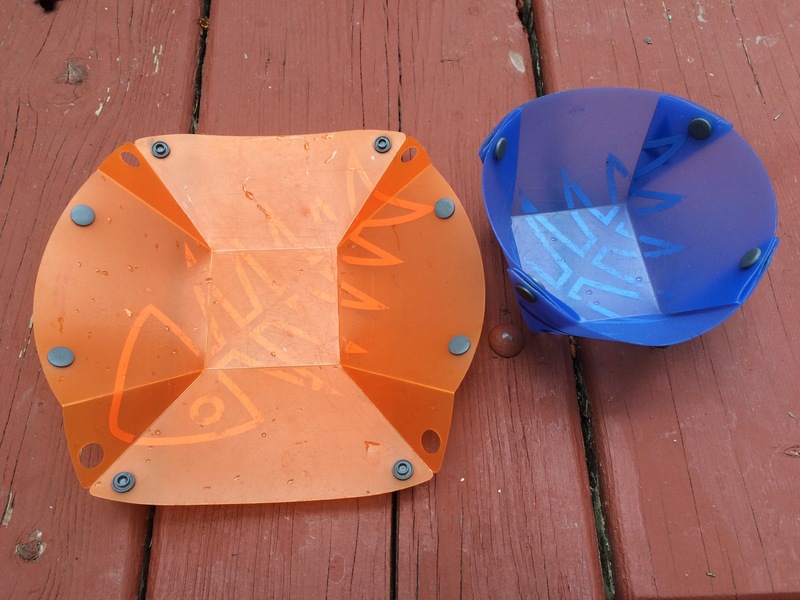 I’ve used these bowls since 2007, when I spent my summer backpacking in northern New Mexico. They are wonderful and I hope they never go out of production. These bowls serve as cutting boards and plates when not folded into bowls and store easily in the back pocket of a pannier. 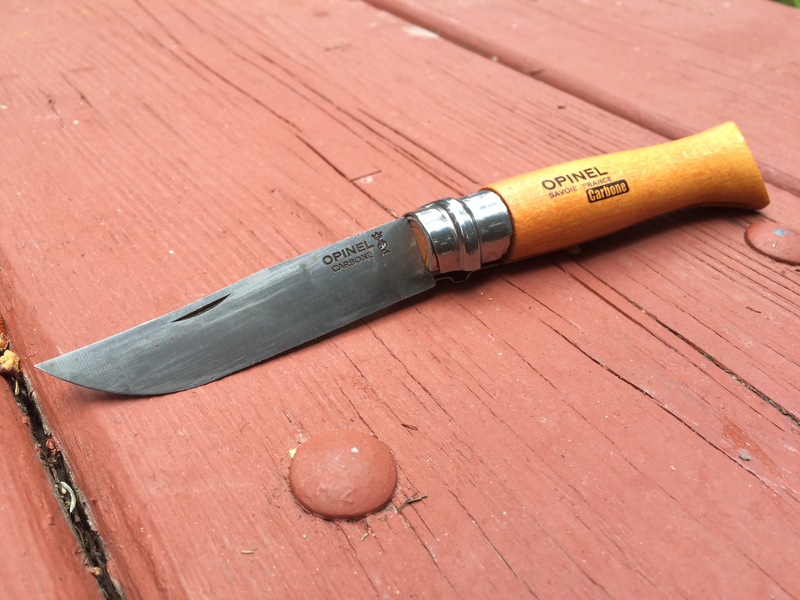 Opinel Carbone knife. We bought this knife on a whim at an organic food stand in central Washington after Ted told me his main complaint about camp cooking was chopping vegetables with a tiny Leatherman blade. This knife is made from carbon steel, which means it rusts (which we learned the hard way), but you also never have to sharpen it. We didn’t know all of this at the time of purchase, but we met a Dutch couple who pulled out a larger version of our knife and said they had owned the knife for 30 years and wouldn’t go on a bike tour without it. It’s proven to be pretty great and has increased Ted’s willingness to help cook, so it’s certainly one of my favorite things! 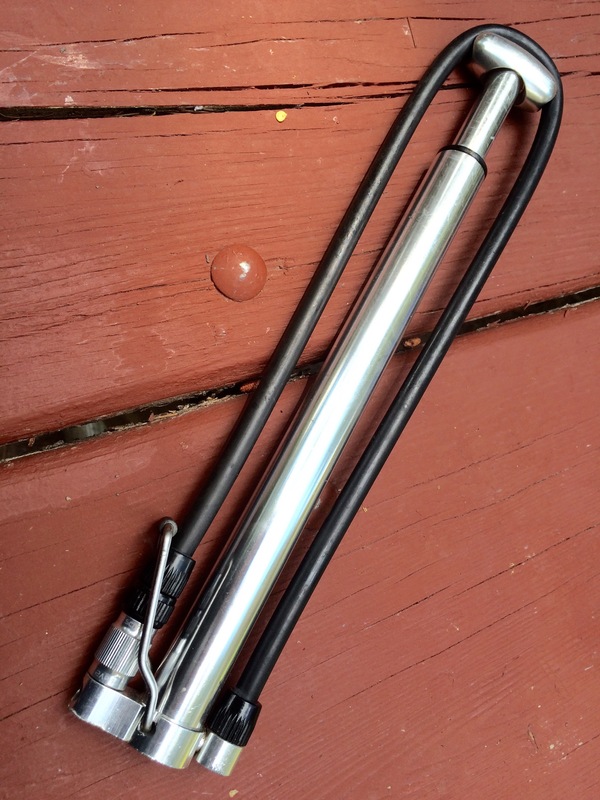 Lezyne standing mini bike pump. We love our Lezyne floor pump at home, and the travel pump–specifically, the travel pump with the foot stand that allows you to pump on the floor–is the best travel pump we’ve used. We can get full pressure in our tires, which is almost impossible to do with most travel pumps, and it’s not nearly as arduous to use as other pumps we’ve used in the past. Nemo Fillo backpacking pillow. Now for our luxury items. Some people don’t carry pillows on bike tours, which I think is crazy considering the value of a good night’s rest and the difficulty of getting that rest in a tent. We’ve both owned a few backpacking pillows in the past and all of them have packed down to the size of a jar of baby food. I love this about them, but they lacked comfort. For this trip, we opted for deluxe, inflatable pillows with memory foam and fabric covers that weigh over a pound and pack down to the size of a liter jar (a huge space / weight sacrifice on a bike). These pillows are magic. Ted is never able to sleep in a tent and he’s been sleeping well this trip. This is one of the times we prioritized comfort over all other practical considerations and we’re glad we did. 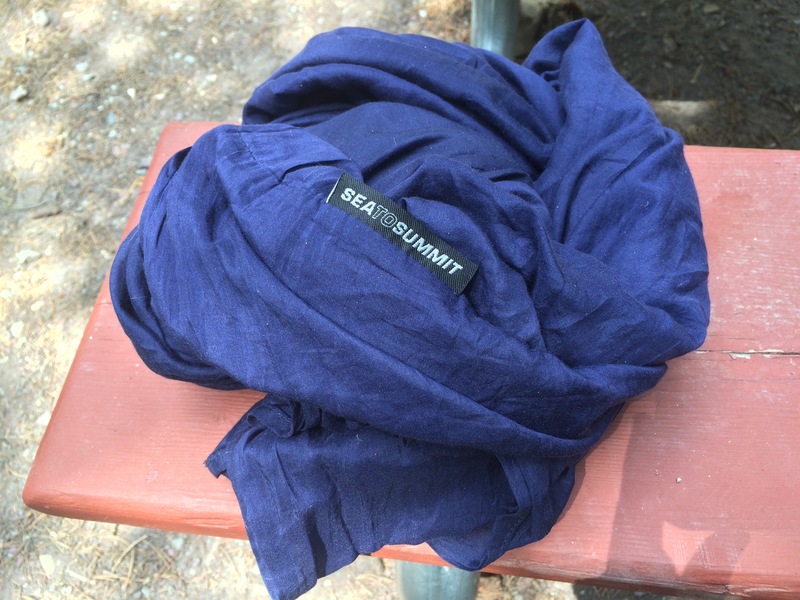 Sea to Summit silk / cotton sleeping bag liner. We didn’t expect to have regular access to showers, so we bought these sleeping bag liners to keep our sleeping bags fresh. 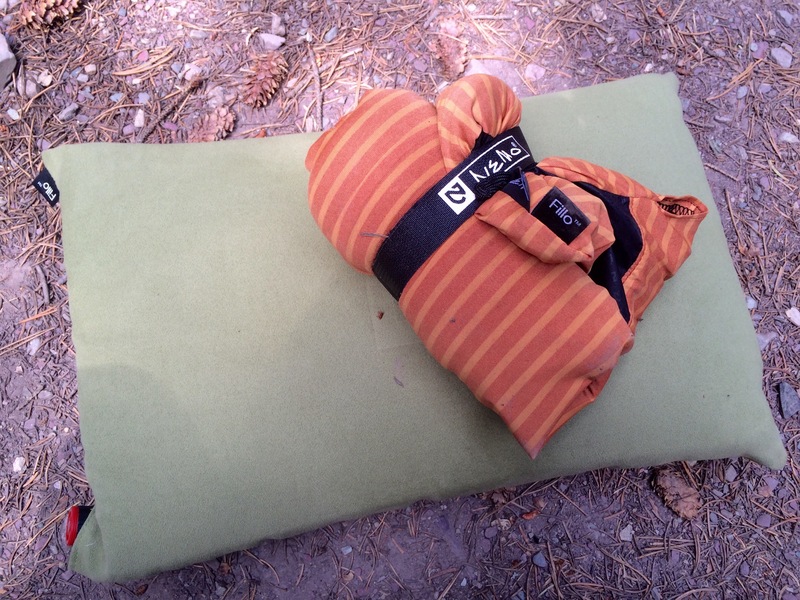 We’ve found that we prefer to sleep in these liners every night, using our sleeping bags as quilts, particularly during last week’s heat wave. They also came in handy when we stayed in the Bacon Bike Hostel in Colville, WA, which didn’t have bedding and was too warm for sleeping bags. 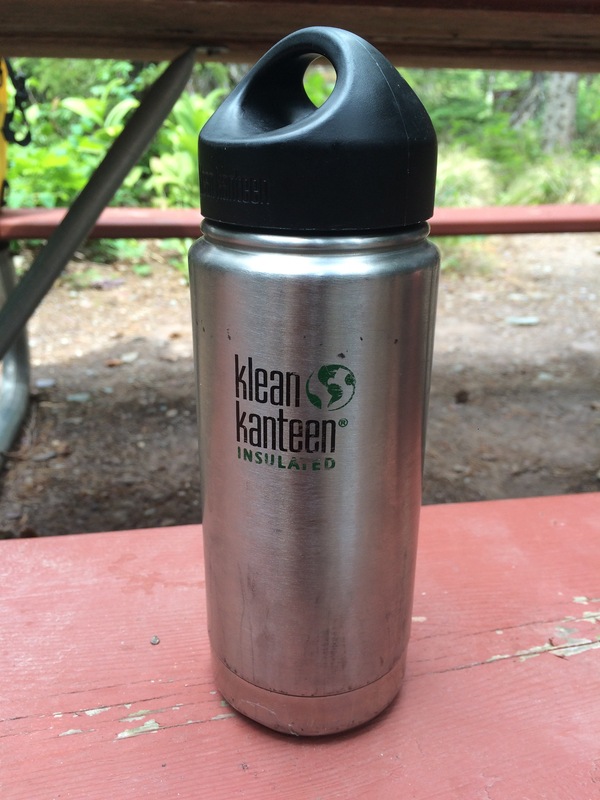 Kleen Kanteen insulated water bottle. Again with the heat wave, it’s been nice to be able to keep drinks cold when we have access to ice or even when we have access to cool tap water. The insulation is high quality; we’ve kept ice in these bottles for over 36 hours. They fit perfectly in our water bottle cages, too, which is a rare quality among insulated water bottles. They also serve as our tea/coffee mugs. REI Flexlite chair. Ted hates sitting on the ground. He blames it on his lack of flexibility. 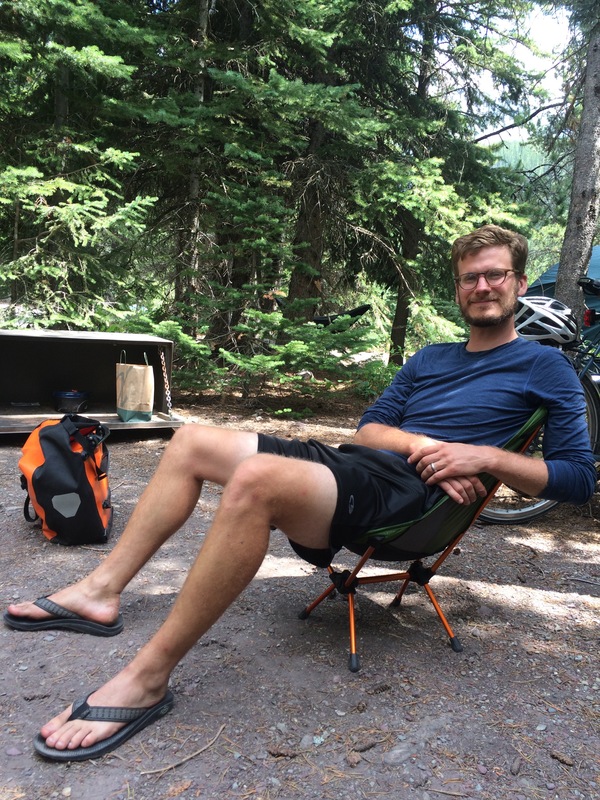 I’m not complaining because this hatred fueled our search for a comfortable, compact backpacking chair, which I would never have been able to justify purchasing if his hatred were only a mild dislike. These chairs occupy otherwise unused space on Ted’s rear rack and have been well worth their weight. Although we’ve been lucky to have picnic tables at most of our campsites, the chairs come in handy when we don’t have picnic tables, when the picnic table is in the sun on a hot day, or when we decide to take an hour-long break in a shady spot on the side of the road. Great tips! Many of these would also be valuable on a long backpack trip too, so I’m glad you shared. Loving every bit of your blog. What a view at Many!! I’m glad you’re enjoying it! Yes, Many Glacier was spectacular. You should definitely visit if you haven’t already!